When hatred and divide is most heard, then such a religious harmony becomes symbolic and soothing. 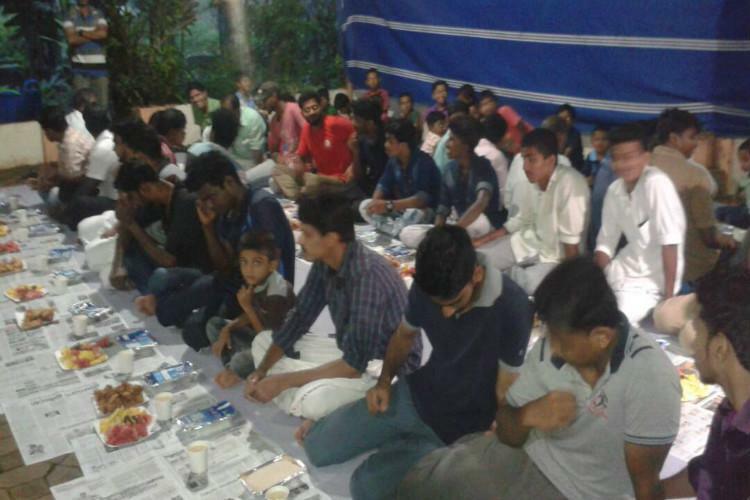 Lekshmi Narasimha Murthy Vishnu Temple, in Malappuram, organised held the Iftar party for Muslims in the holy month of Ramzan. The temple is under going renovation works and so conducting Punaprethishta (restoration) rituals from May 29 till till July 4. As many as 400 Muslim people participated in the function along with 100 people belonging to other communities. As the temple could not house so many people at same moment, so the Iftar party was organised in the house of Mammu Master . “We have grown up in an atmosphere of religious harmony. What matters for us is humanity, not religion. Everybody has the right to follow their religion or caste, but it does not mean that we should not be friendly to people of other religion. We should not close our heart from welcoming people of other religion” Temple Committee Secretary PT Mohanan told TNM. Vegetarian dishes were served, including the traditional Kerala meal i.e. sadhya. Muslim families were informed well in advance of the party and they turned up in large numbers. “There was no hesitation from anybody’s part. The response was overwhelming,” Mohanan added. Please share as much as you can do.